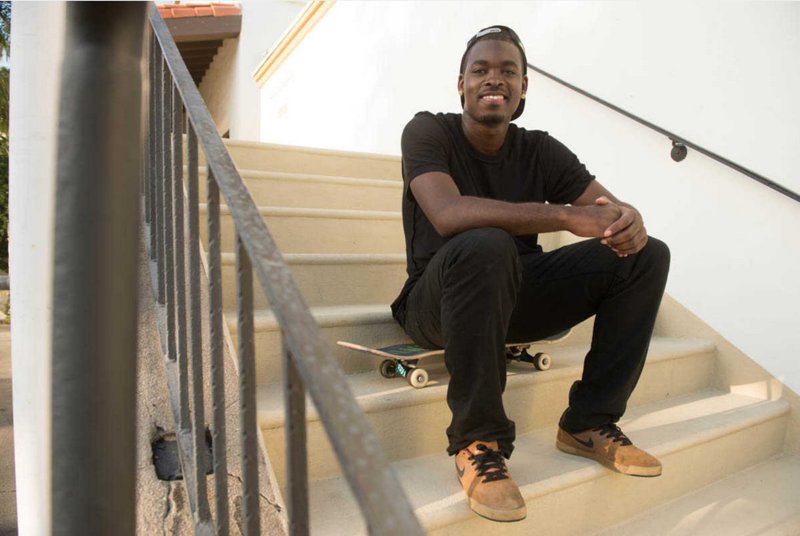 Theotis Beasley has made a name for himself in the skateboarding world, landing sponsorship deals with Nike SB and Mountain Dew and becoming a fixture at Dew Tour events across the country. When he’s not boarding, Beasley’s playing in 3-on-3 pick-up basketball games, bowling with friends, and voraciously chowing down on peach cobbler at his favorite BBQ joints. He’s also got his finger on the pulse of what’s on the come-up. There’s this app called Sqvad Up, and that’s pretty dope. It’s a cool little [skateboarding] app. When you get bored, it’s something to play, mess around with. Postmates is another cool app. You put in a request and tell them what you want, and then some random person will go to the store for you. It’s a dope app. [A person] will go to the store for you and get your toothbrush, maybe water, or Dominoes. They gon’ get it for you, just whatever. And once you order, you just chill and wait for it. Jason Markk, my homeboy out in Los Angeles, I use the shoe cleaner he got for keeping the Jordans clean. It does a great job. If you scuff up your kicks, you use the little cleaning tissues they got, the wet wipes or whatever. It’s great. They make your Jordans look new again. They help [clean] skate shoes too, everything shoe-wise. It’s like the best shoe cleaner ever. Dejay The Kid, he one of my boys. He gotta get heard. Super dope. He got a couple things on YouTube, not that many, but he got a dope sound. I think once he gets heard, it’ll be a good look for him. He got kinda like that TDE vibe, like Kendrick Lamar-type vibe. That whole Top Dawg crew. He’s from LA.